Toyota’s special edition 86 GRMN sports car is the first production vehicle to feature a rear quarter window in polycarbonate (PC) material with a plasma-coat solution designed to deliver the highest level of durability performance. The vehicle, exclusive to Japan, exhibited earlier this year at Tokyo Auto Salon 2016. Until now, manufacturers have produced rear quarter windows in PC using wet-coat only solutions. Depending on vehicle type and passenger position, wet-coat solutions can meet industry requirements for weatherability and abrasion resistance at that window location. In some cases though, a higher level of performance is required to meet driver visibility needs. Because Toyota wished to achieve regulatory requirements at a global level, the Japan-based OEM turned to EXATEC™ plasma technology from SABIC. This flexible glass-like coating is deposited on top of a base wet coat to enhance performance. Applying this advanced coating made it possible to meet Toyota’s high quality requirements. SABIC contributed materials and development expertise to the 86 GRMN window program. EXATEC plasma coating technology from SABIC can make it possible for PC-glazed windows, where regulations allow for their use, to meet legislated driver visibility requirements. For larger PC-glazed surfaces like backlights and sunroofs, weight savings of up to 50 percent can be possible, helping automakers to improve fuel efficiency and lower emissions. In addition, compared to other material solutions for windows, new combinations of style and function are possible with PC glazing. For example, rear quarter windows can smoothly integrate an aerodynamic spoiler, roof pillar, airflow separators, door handle scallops and even rear lamps. 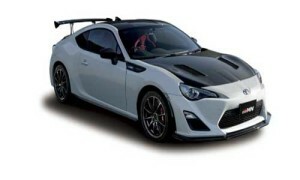 For the 86 GRMN rear quarter window, Toyota only focused on the production of a durable, lightweight part, in support of its evaluation of the plasma-coat solution for use on a mass-produced global model. Toyota’s evaluation of PC glazing technology for use in high volume production vehicles includes work to validate the manufacturing process for plasma-coated parts. The 86 GRMN rear quarter window is Toyota’s first use of SABIC’s plasma-coat solution for a commercially available vehicle.